عندما تزور بريسبان, ستشعر أنك في بيتك في The Sebel Brisbane Hotel الذي يقدم لك إقامة متميزة و خدمات عظيمة. يسهل الوصول إلى هذا الفندق ذو 4.5 نجوم من المطار، فهو يبعد عنه مسافة 16 KM فقط. إن سهولة الوصول من الفندق إلى المعالم السياحية الشهيرة الكثيرة في المدينة كمثل Skatebiz Venue, The Art Of Fine Chocolate, Archives Fine Books هو استثنائي بحد ذاته. كما يقدم The Sebel Brisbane Hotel الكثير من الخدمات لإغناء رحلتك في بريسبان. تتضمن الميزات الرئيسية في هذا الفندق: خدمة الغرف على مدار الساعة, خدمات بريدية, مجهز لذوي الإحتياجات الخاصة, مكتب الاستقبال على مدار الساعة, مرافق مخصصة لذوي الاحتياجات الخاصة. يمكن للنزلاء الاختيار من ضمن مجموعة من الغرف المصممة بعناية لتعكس جواً من الراحة، والتي يتجاوز عددها 160. يقدم الفندق مجموعة واسعة من وسائل الراحة المتنوعة، كمثل: مركز للياقة البدنية, ساونا, مسار جولف - ضمن 3 كم, حمام سباحة خارجي, مسبح (للأطفال). إن The Sebel Brisbane Hotel هو مكان مثالي للمسافرين الذين يتطلعون إلى الراحة والاستجمام في بريسبان. الإفطار لا يشمل الأطفال الذين يتمتعون بإقامة مجانية في حالة استخدام الأسرّة الموجودة في الغرفة. Stayed here for 2 nights on business travel and it was perfect for my stay. 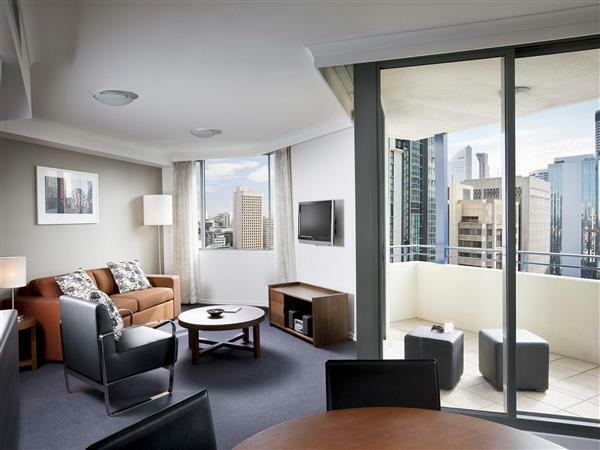 Great central location in Brisbane CBD. Staff were friendly and helpful. Taxis were ordered promptly whenever I needed one. Room is comfortable and clean, and are furnished with modern and contemporary furniture. The exterior of the hotel was also modern and new. There is also an equipped gym and a lap pool which was great. Breakfast buffet was sufficient with ample hot food but restaurant quality is otherwise poor. 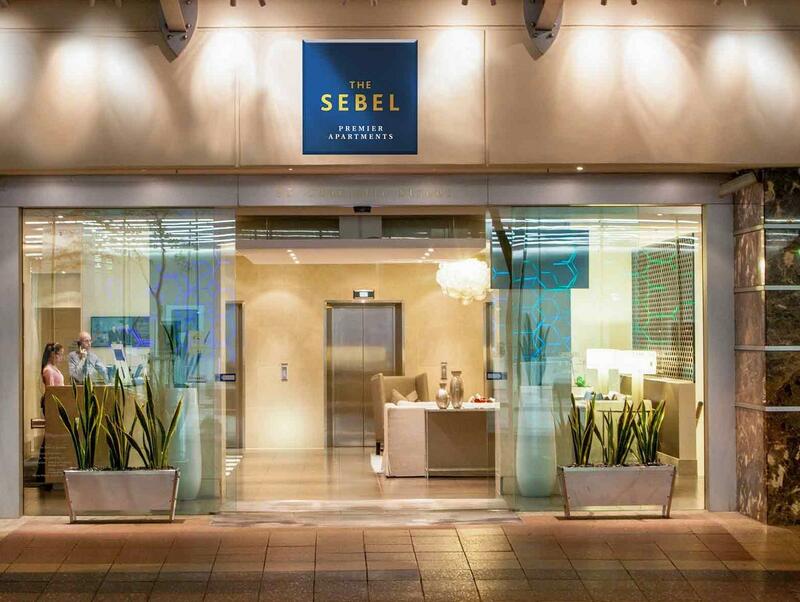 I enjoy staying at any Sebel hotel in Australia as I always find it to be extremely great value for money. great location, friendly staff. coffee shop connected was a let down. waited over 20 minutes for coffee - we were the only ones in the store. Thanks for your review. We're glad you loved your experience albeit the slow service in the restaurant. We hope we will see you again soon. Really great apartment hotel! Just FYI parking is 28 AUD per day of you have a car. Otherwise the location is great in Brisbane. The bathroom was recently updated and very nice (with bath tub) and the mattress was very comfortable, I was out like a light. It had a washer dryer, 2 in 1, which is nice. I’ve never used one of those machines before but it doesn’t dry that well. So if you use it make sure you have plenty of time to let it dry before you leave. The comforter was kind of an old looking fuzzy blanket between two thick sheets. I didn’t have a problem with it at all but it was a bit odd. Stayed in one bedroom apartment with two young children. Very spacious, very comfy bed. Great location in CBD. Only frustration was being charged later in the day following check out for items from the mini bar when I had not taken any items from minibar, which was stated on check out. In process of arranging refund. Would stay here again. Great overnight stay on 14th floor meant no morning traffic noise. So convienent for riverstage concert we attended. 11am checkout allowed us breakfast at our leisure. Would have prefered complimentary parking as after paying for the room think that you shouldn't be hit with another $28 to park. Otherwise very accomadating staff and a beauyifully clean room. The rooms are spacious, clean and well presented. The entire hotel is immaculate. It is within a few minutes walk of pretty much everything in the hub of the city. We needed a night to recover from jet-lag before continuing our journey. 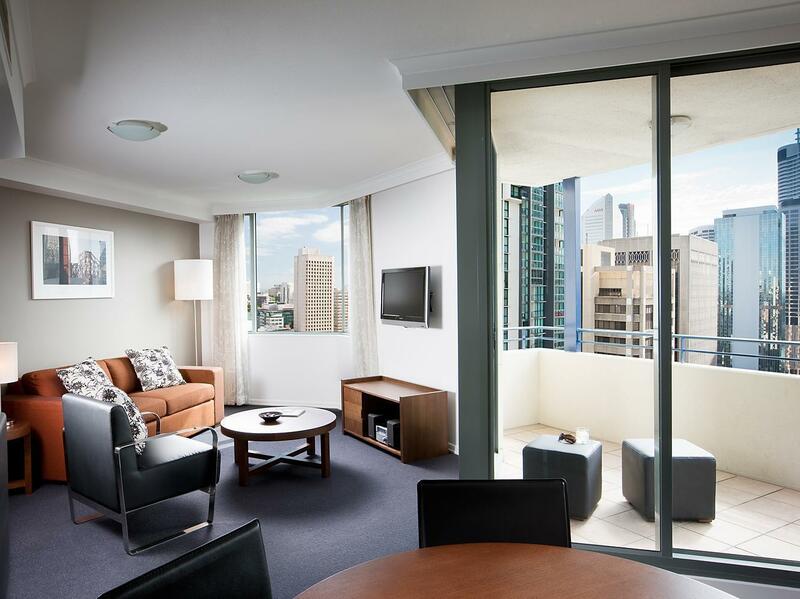 We had stayed at the Sebel previously so booked a night and were not disappointed. 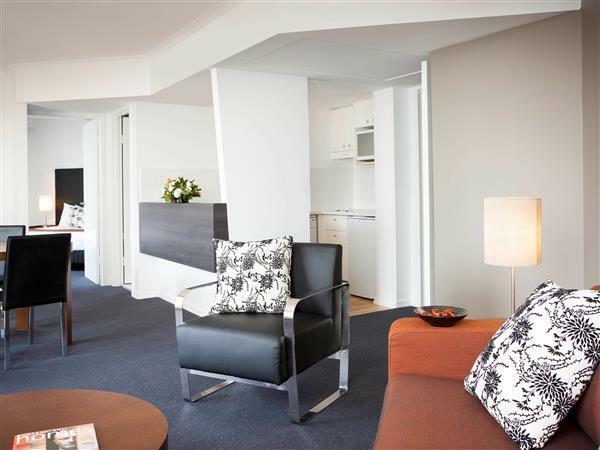 The Sebel is a classy inner-city hotel, close to everything we needed and is always immaculately presented. Cannot fault the staff for their courtesy, presentation and guest relations. We'll stay here again! We decided on a last minute celebration of our 33rd wedding anniversary and my husband's 65th birthday & decided on a city escape. The staff were helpful & friendly, even surprised us with a bottle of wine, the room was large & comfortable, and dinner was very enjoyable. We walked to the Myer Centre, Southbank, the Museum, & Eagle St Pier - all very close. Overall, it was really lovely. Our stay was fine, our dinner service was fairly slow and the staff were inattentive. They didn't offer drinks when seated and when I ordered a drink he walked off without offering my work colleague a drink. We finished our mains and they didn't even offer desert. Poor service. Breakfast was a good selection but no air conditioning. Location! Right in the middle of busy Brisbane! Outstanding! Great staff!! Nice clean room. I didn't want to leave. Also, the cafe on first floor was delicious! I ate there every morning...STRONGLY recommend their Eggs Benedict! :) I would recommend this hotel a hundred times over to all my family and friends. I chose this hotel for it's modern looking spacious rooms and was glad of my choice; a king-size bedroom with a lovely view of the city lights. The staff were cheerful and provided great service assisting with any queries. A good selection is available for breakfast in the hotel cafe. was like every other well made establishment. clean, tidy, reception was easy to deal with and provided late check out to 11:30 which was amazing! if your looking for a nice stay, cosy, comfortable and right in the city, this place is the place for you. Had a very good time room service was very quick in bringing some ice and ice trays when we asked for them, breakfast was right on time. We wrote a few different things on the breakfast form asking for double shots in our coffee and bbq sauce on the burger no tomato everything was taken care of with attention to detail. 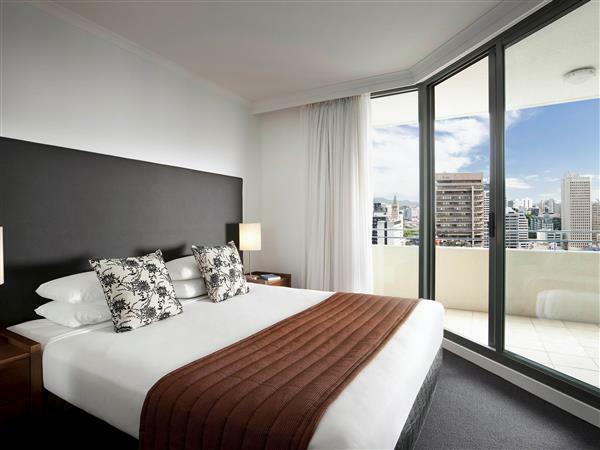 I could highly recommend the Sebel to anyone and if I need a place to stay in Brisbane again I'll definitely be going back there. We were most satisfied with our stay in this hotel. The room is bright and clean. It has a big balcony and a small kitchen with washing machine, drying machine, microwave oven and dishwasher. The reception staff was most helpful and always smiled warmly. Stayed for several nights before and after trip to Fiji - hotel took care of unwanted luggage while we were away, and placed it in our room for our return. This was a nice touch. There are many nearby restaurants which give plenty of choice for all palates. We only ate in the hotel once (breakfast on a public holiday) and we were dismayed to find the coffee included with continental breakfast was poor quality, help yourself stuff rather than "real" coffee for which we had to pay extra. But overall our experience was very positive. We stayed at the sebel suites hotel for one night in a premium studio room which was on the 26th of their 30 floors. Although not guaranteed a view upon booking, our room had a decent view over the city and across to the Southbank Wheel. The room itself, and even the hallway to the lifts had that "4/5ths" feel- the ceilings felt a little close to the top of our heads! When you stood in the bath which was under the shower, there was about half a foot from my head to the ceiling! The room itself was clean, looked new and fresh and was pretty tiny. It was nice, but not luxurious. The staff were fine, nothing special. The location was supreme! Right in the centre of the CBD just 2 blocks from Queen St Mall and 2 blocks from the botanical gardens, even 2 blocks from the famed "Restaurant 2" where we had lunch. 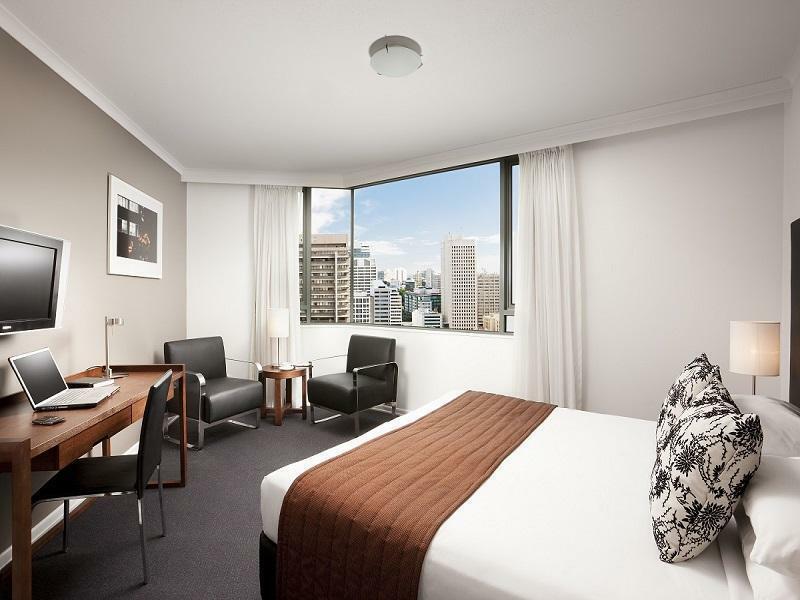 Arriving from Sydney, I needed a place to stay that was reasonably priced and close enough to the CBD. This hotel ticked all the boxes. It's well kept, the rooms are decent and clean. Like most places around Australia, the staff could have been a bit perkier, however, all in all they were attentive. I would highly recommend anyone to stay here.